Beguine Communities and Medieval History: An Unexpected Treasure? It is my pleasure to welcome Jennifer Kolpacoff Deane, Associate Professor of History, University of Minnesota, Morris, as my guest blogger this morning. Feel free to pose any questions as comments, and I’ll post Jennifer’s responses! A little background on Jennifer: “I am a historian of medieval Europe, although my reading and teaching interests extend both to the ancient and the early modern. My research focuses on medieval religious movements and communities, the emergence and application of the construct of heresy, inquisitorial procedures, and gender. I am also interested in lay female religious communities across and beyond the medieval centuries, and in the relationship between spirituality, discipline, gender, institutions, and the social order.” She’s the author of A History of Medieval Heresy and Inquisition (Rowman & Littlefield, 2011), co-editor (with Letha Böhringer and Hildo van Engen) of Labels and Libels: Naming Beguines in Northern Medieval Europe (Brepols, forthcoming 2014), and the author of Sisters Among: Beguine and Lay Religious Women’s Communities in Medieval Germany (monograph in progress), as well as many articles. On April 27, 2013, The Economist magazine was among dozens of news outlets reporting the death of a 92-year-old Belgian woman named Marcella Pattyn, ‘the last beguine.’ For those who study beguine history, encountering the topic on the evening news was a surprising and yet bittersweet moment. For a few short days, an international spotlight shone on the relatively obscure realm of beguine history, if only to reflect upon the apparent demise of an 800-year-old way of life. For any visitor to Belgium, the surviving structures of beguinages are indeed (as The Economist put it) an ‘unexpected treasure.’ The description has lingered with me since April, the image of unexpected treasure evoking the very roots of Marcella’s life and that of her thousands of unnamed sisters: that is, the broad and dazzling historical constellation of lay religious women’s communities in medieval Europe. Far from being limited to the Low Countries, hundreds of beguine-like gatherings independently cropped up between the thirteenth and sixteenth centuries across what is today France, Germany, Italy, England, Sweden, the Czech Republic, and Spain. Particularly since Walter Simons’ landmark study of beguines in the Low Countries (Cities of Ladies, 2001) researchers have been reapproaching beguine history from new angles and having conversations across many of the traditional boundaries of language, region, and national history. Because of Marcella Pattyn’s life and death, news editors in Europe and North America suddenly had to address the following: what was a beguine, anyway? The question seems simple enough, yet the answer has been surprisingly difficult to pin down – not only for journalists in 2013, but also for historians over the past several decades. Why is that? One could point to several reasons, starting with the challenge of defining our terms. For example, beguines inhabited a space that blended secular and spiritual roles in a way that does not easily square with traditional categories. As a result, many influential 19th- and 20th-century historians (whether writing in German, Dutch, or English) defined beguines in negative terms that primarily reflected the concerns of medieval clergy about beguines’ relationship to the Church: thus one still frequently finds beguines depicted as ‘not-nuns,’ ‘lacking a formal rule,’ ‘not affiliated with orders,’ etc. Newer research has been trying to develop a more sociological approach to beguine history, considering instead what being a beguine meant to the women themselves, and what their communities meant to the local clergy and laity who supported them across time and space. For although beguines outside of Belgium are sometimes thought to have disappeared by the end of the Middle Ages, many communities survived deep into the early modern period and beyond. Another problem is that the terms used by and applied to beguines have varied so much over time and place that it has been very difficult to establish any kind of broad framework or systematic comparison. For example, a woman termed a ‘beguine’ in one region might be called a ‘begutta’ in another, or a ‘bizzocha’ or ‘pinzochera’ in yet another. Some terms designated a lay religious woman by the precise color of her garb, such as the ‘Black Sisters,’ ‘Grey Women,’ or the ‘Blue Beguines’ of northern Germany. And yet other terms that appear in medieval documents by and about the women include vernacular and Latin variations on ‘sister,’ ‘virgin,’ ‘widow’, ‘good woman’, ‘spiritual sister’, ‘soul woman’, ‘holy woman,’. . .and often combinations of the above! As a result, we are still trying to figure out a way to talk about lay religious women’s communities through this swirl of language. Yet even as we struggle with our terms and categories, it becomes clear that (to adapt the famous phrase) medieval people ‘knew a beguine when they saw one’. Thus one of the exciting directions in new research has been comparative work establishing some common themes across lay religious women’s communities while still recognizing their tremendous elasticity of size, recruitment, relationship to other institutions, and so on. So: what was a beguine? Today one might offer a definition along these lines: beguines were single women of any life stage enacting visibly pious and chaste lives of Christian service and community; they took simple oaths of chastity and obedience, lived according to a specific but local house rule, and were under the supervision of a house mother, elder sisters in the community, and an array of parish and civic authorities; and finally, beguines received charitable donations in exchange for prayers, memorial services, and other caritative services. And yet apart from these consistent underlying features, there were endless possibilities for variation and local adaptation. Beguines could be affiliated with mendicant orders such as the Franciscans or Dominicans, for example, either through pastoral care, routine interaction, or by formally taking on a Third Order rule. They could also be linked to care within a hospital institution, whether as formal residents, or providers of health care during the day, and even tending to the bodies and burial of the dead. Beguine communities might provide a safe and respectable home for wealthy widows, an equally safe and respectable home for impoverished women. . . or they could combine all of the above, depending on the local context. Defined by their fundamentally local quality (rather than being shaped by an overarching institutional organization), beguine communities were historically flexible and enduring, deeply woven into the fabric of medieval society. Although beguine communities were certainly independent from each other, their members were never independent of parish and civic authority. Nor did they seek to be, since connections and exchange were evidently in the women’s best interest as well as strategically productive for the environments in which they flourished. Indeed, one of the many intriguing aspects of beguine history is the wide range of people who invested both spiritual hope and financial resources into their foundations: archival material speaks to a centuries-long certainty among laymen, laywomen, married couples, nobility, priests, canons, and bishops in the power of beguines’ prayers and their value to local communities. 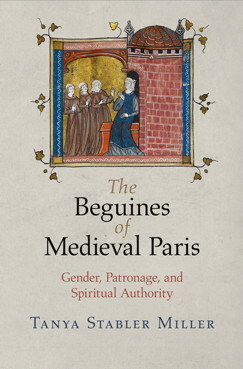 Even the saintly King Louis IX of France (d.1270) supported beguines, as Tanya Stabler Miller discusses in her wonderful new book (The Beguines of Medieval Paris, 2014). All of these new publications and conversations suggest that although ‘the last beguine’ may have passed, we are not through discovering the unexpected treasures of beguine history. Copyedit’s Off! and Coming Soon…. ≈ Comments Off on Copyedit’s Off! and Coming Soon…. Yesterday I returned the copyedit of A Triple Knot. Hurrah! Those of you familiar with the publishing process know the significance of this stage. As the cover letter from my publisher reads: “This is the last time you will have the opportunity to make extensive changes. You will see page proofs after the book is typeset, but changes in proofs must be kept to a minimum. Otherwise you may incur charges for author’s alterations and jeopardize the schedule and publication date for your book.” Doomsday. Last chance. On the ledge. Suffice to say, except for Thanksgiving Day, I have worked over the manuscript for the full fortnight allowed. I am exhausted, but happy. So, much cause for celebration! And part of my first day off has been spent reading with great pleasure the guest post I’m putting up here later this week, a companion to an earlier post (May 2013), “The Last Beguine”. With Jennifer Kolpacoff Deane’s permission, I provided a link in that post to her article giving some background on beguines, and while I was contacting her I asked if she might be interested in writing a guest post for this blog. And Jennifer has. So stay tuned!